A group of 10 Baylor students and three faculty and staff members went to Jamaica to spend Spring Break engaging in community service among the orphans, the aging, and the school children of Kingston. This the 22nd consecutive year that Baylor students have made the service trip. Selection for the Jamaica trip is among the highest honors a Baylor student can receive, said officials. Participating were trip chaperone and Baylor Athletic Trainer Lori Moss, senior Ada Ludwick, trip leader and Community Service Director Elin Bunch ’09, junior Maggie Clark, trip creator and Assistant Community Service Director Joli Anderson, senior Bailey Priddy, senior Jalen Holley, junior Maggie Kerley, junior Sara Catherine Daniels, senior Zoe Rye, senior Taegan Bunch, junior Ellie Raughton, and junior Lucy Townsend. 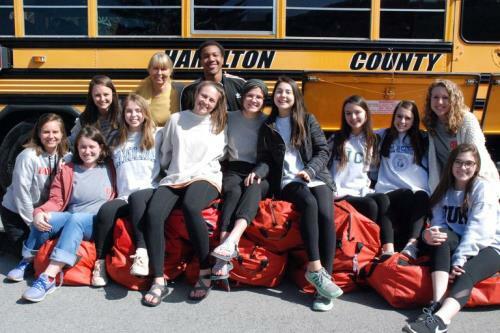 In addition to their service work, the students will deliver large duffel bags stuffed with school supplies to needy children in Jamaica. The students also raised thousands of dollars, by letter solicitation and from the Midwinter Night's Blast benefit concert, for the Jamaica Education Fund, established in 2002 to help children in Jamaica attend school.